The smooth Luxurious Hand Painted Leather Bag is as functional as it shows style. With a handle that makes it easy to carry on your arm or your shoulder, this style handbag has been designed by our best in class designers and made from top grain leather. Great craftsmanship, strict quality control and meticulous attention to details, make this handbag beautiful and unique. The embossed leather used for the front and the back side along with the inside lining material completes this bag. It presents a very perfect solid line and graceful shape and is practical and elegant, from all viewpoints. Nice but too small. My bad! The bag is beautiful and fits the description. The only thing is that the bag came crumpled. This purse is of great quality. The leather used is very high quality as are the hardware pieces. Very classy snaps, and attachments. Very pleased with this purse and the wallet to match. I like it very much but it is small. сумоча класная. all advise. to store thank you very much. I just received this handbag. It is small and can only hold essentials, (data sheet wallet, pen, mirror, phone). Decorative front and back with zipper but pure on sides, there is not a lot of space inside but enough. 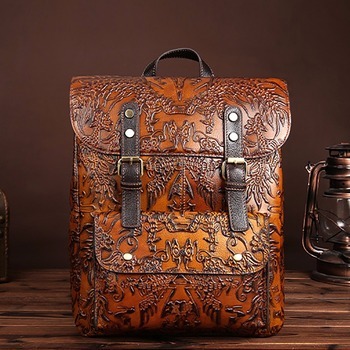 One leather hand and the other that's fitted to the shoulder, convenient, not off the shoulder but there a lot of workmanship in these bags, It is small, check the measurements, however it does not spoil the bag.